Here is a list of Syndromes related to Benign and Malignant Tumors of the Oral cavity. There are not many tumors associated with tumors of the Oral cavity as most of the tumors are mainly caused due to etiologic factors other than genetic reasons like habits of tobacco, ghutka, infections etc. So here are the 4 Syndromes which are associated with benign and malignant tumors of the oral cavity. Hyperplasia of Pituitary parathyroid, adrenal cortex and pancreatic islets. 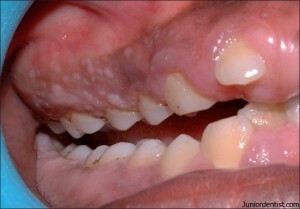 I had a chronic case of oral papillomatous lesions whose picture is quite similar to your photo. I want to discuss this case with you. These lesions are present in him about since birth and he is undergoing treatment from a pediatric surgeon with some monthly injections and oral medications for last 5 years, but with no significant improvement. A pediatric surgeon prior to him diagnosed him as angioma of cheeks.